Do you have kids or students who want to learn how to type? Dance Mat Typing by the BBC is a good choice. It is interactive, fun, free and easy-to-use for kids; the system is complete with animated animal characters, graphics and sounds. 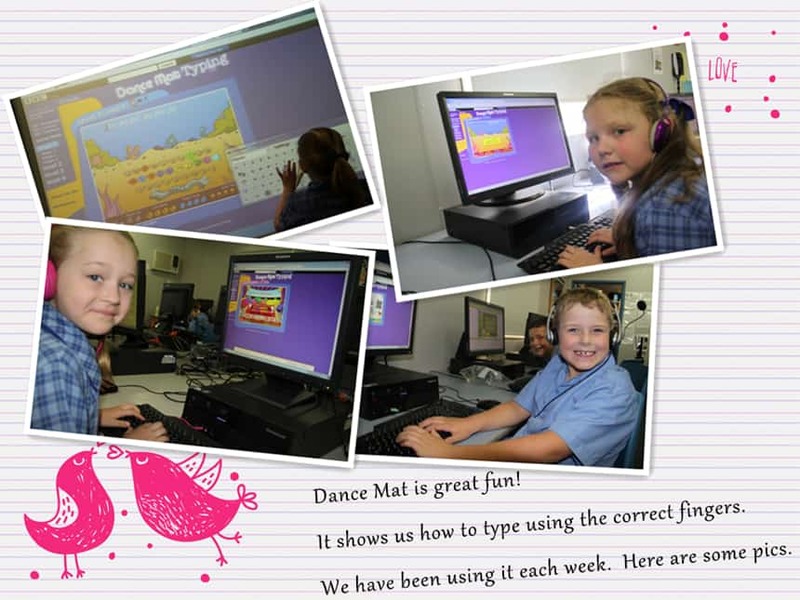 We provide friendly menus or lists and other cool stuff to make it easier for you and your kids to use Dance Mat Typing to effectively learn how to type. Dance Mat Typing is structured as a series of four levels with three stages for each level (you can find them in the menu above). The animated animal teachers take kids through each of the 12 stages, narrating and showing them where to place their fingers on the keyboard, which fingers to use to type particular keys with onscreen cartoon hands. At the end of each stage, there is always a song by the teacher and his or her supporting cast to celebrate the kids’ accomplishments. Hello kids, welcome to join the Dance Mat Typing course. In this course, there are totally 12 stages divided into 4 levels that will help you learn typing from scratch. Even though you don’t have any clue about typing now, you will become a “typist” who can type fast without looking at the keyboard when you finish all the tasks in these 12 stages. There must be tons of different courses and practicing programs for typing, but most of them are not attractive to kids or students because of the boring exercises and low-quality images. With this BBC typing course, you will experience a totally different learning journey. Now, let me give you guys a general introduction about the BBC typing class – Dance Mat Typing. You will meet different teachers in this flash course. They are (from the first stage to the last stage) Goat, Octopus, Rooster, Hip, Ninja Turtle, Flamingo, Yak, Giraffe, Queen ant, Cat and Snake. When you come to the last stage, you will meet the whole family there, and I can’t wait to tell you that there is a big party waiting for you! In each stage, there are also some support characters. They will give you some tips when you cannot type on the right key, and they will pay you compliments when you finish a task. Different scenes are designed for each stage in this flash game of learning typing, you will learn how to type while appreciating the beautiful views. It will make you feel like you are traveling if you open your mind to imagine. In different stage with different scenes, the tasks are set up with different objects. For example, in stage one, because the goat is a rock star, you will break all the music discs at the bottom of the screen when you finish all the tasks; in stage three in which the main cartoon character is rooster, you need to break all the eggs to accomplish all the tasks. Apart from all the things mentioned above, the characters will say something very interesting in the process of learning typing. For example, the octopus in the stage two will teach you some Italian like “ciao, bambini” which means “hello, kids”, and the yak in the stage seven will take you to one of the most mysterious places in this world – Tibet and tell you some mysterious stories about it. Last but not the least, one of the highlights of this flash is the music. Different cartoon characters will play a different genre of music. For example, the rock star, goat, will sing a rock roll song with playing guitar; the yak from Tibet will play some kinds of Tibet music which are really quiet and mysterious; The flamingo will bring you some lively Spanish style flamenco music. Anyway, all I want to say is that this BBC typing course is really interesting and useful. You will learn how to type fast without looking at the keyboard while having fun. I promise you won’t get bored. Giving it a try will be more meaningful than anything I said here. Enjoy the Dance Mat Typing!